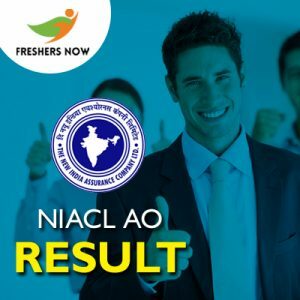 NIACL AO Result 2019 Announced… On 22nd March 2019: Aspirants looking for the newindia.co.in Administrative Officer Result 2019 can check this page to get their NIACL AO Result link from this post. Moreover, to help the hopefuls, we also provided the NIACL AO Cut Off Marks 2019. The candidates attempted the test on 2nd March 2019 for the post of NAICL Administrative Officer (Scale-I). Along with the Result, you can alos get more information like NIACL AO Merit List 2019. Refer all the details given to get a clear idea. Furthermore, we suggest the qualified candidates to stay in touch to get more details. All those candidates who have qualified for the interview round will be able to download their Interview Call Letter by using their login credentials tentatively from 28th March 2019. NIACL AO interview is scheduled to be conducted from 8th To 22nd April 2019. The details about the venue will be mentioned in the NIACL AO interview call letter. After referring to the above table, you may get the details of the NIACL AO Result 2019 in brief. Moreover, scroll down for some more information which is very important for a candidate to know. Accordingly, in the below sections, we gave the details of the NIACL AO Cut Off Marks 2019 and also the Merit List 2019. Keep on checking the official website regularly which is given in the table to know the Merit List and scores of each individual attempted the NAICl Exam. Also, the candidates will be placed all over India after the further rounds included in the Selection Process. Furthermore, you can keep on referring for detailed information from the below sections. New India Assurance Company Ltd (NIACL) releases the NIACL AO Cut Off Marks 2019 based on some factors such as difficulty level of paper, a number of candidates appeared in the examination, number of posts, the category of the candidate. However, the cutoff marks play a crucial role to select candidates. The category wise cut off marks for both Prelims Exam and Mains Exam are given in this section. It helps you to know your result and the qualifying status. The given table gives you information about the Category Based Cut Off Marks. The aspirants are also in search of the NIACL Merit List 2019 along with newindia.co.in Administrative Officer Result 2019. As per the notification, the officials of the NIACL is releasing the Merit List with a few days. So, after knowing the Result, candidates need to wait with much more patience. As said earlier, the Merit List contains the list of the candidates who got selected in the Prelims and Mains Exam. After that, the candidates can refer to the downloading process from below section otherwise can get the Result directly from the given Download Link. Also, you can download the NIACL Administrative Officer Result from the Link which is available in this section or else, you can follow the steps given below. Now, by scrolling down you can see the column showing List of Roll Numbers. Candidates for Phase-II- Recruitment of Administrative Officers (Scale-I). By clicking on it you will get the NIACL AO Result 2019. Finally, download it and keep it safe for other professional use. Hence, hope you got all the information regarding the newindia.co.in Administrative Officer Result 2019 and the NIACL AO Merit List. For such similar updates and details, keep checking our website Freshers Now for other details like Recruitment, Syllabus, Previous Papers, Interview Questions etc. Ask for comments and doubts in the comment section provided. Soon we will respond with suitable answers.